It's been an exciting few months for October Drift so far in 2018. 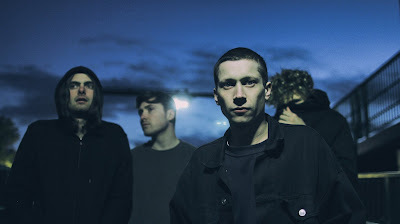 Apart from the release of their new single All Broken Down, available to buy on May 4th, they've supported Editors on their Violence album preview tour and after a few headline dates of their own this week are then out into Europe for two weeks to support them. We caught up with them for a chat ahead of their Night and Day headline show in Manchester this Thursday. First of all, can you introduce October Drift and tells us about how you got together? Hello, i'm Chris the drummer - the second least exciting member of the band after Biz our bassist. Dan the guitarist is the second most exciting member and Kiran the singer is obviously the most exciting, as he's the front man. Apart from when you get stuck sitting next to him in a car for a long time, where he says absolutely nothing for the majority of the duration. We all grew up together in a medium size town with virtually nothing going on in terms of a music scene...so we decided to start a band. You’ve just been on tour with Editors. How did that come about and how was that experience? Yeah we played their UK album shows at the beginning of March, which was pretty surreal. We grew up listening to Editors, so to be asked to support them was a big deal for us. To play to sold out crowds in venues much bigger than what we're used was awesome. We weren't sure how we'd go down with their audience cause live we're pretty heavy, but as soon as we stepped on stage it all felt really easy. It's nice to play a support slot where you can win the audience over in the first couple songs. We've played some support slots where we've had to work for it and others where we've bombed completely - glad that didn't happen. To be honest im not really sure how we got the shows. I guess someone in their team liked us enough to give us a few slots. Sometimes it's just about having the right people believing in what you do. You’re also off to Europe with them. Have you played abroad and anywhere on the tour you’re looking forward to playing in particular? Yeah we were lucky enough to be invited out to Europe for a run of shows with them. We've done a few shows abroad before. Last year we supported Mona across Europe in Germany and Poland, which was possibly one of the scariest but best experiences of my life. The tour came in really last minute for us and we had literally no budget to fund it. So we had to take what we could get in terms of hotels and we ended up staying in some really strange places. I won't go into details, but on one occasion we got accepted into a Polish traveller community and another had to flee from a local football firm. It's always fun to go to places you haven't been before. I think I'm most looking forward to visiting Barcelona, just because I've heard the city is awesome. I think Milan is the show I'm looking forward to the most though. It's in a 12,000 cap arena and it's not everyday we get to play something that big, so I'm excited. On April 12th you’re playing the Night and Day in Manchester. Your shows here have always been really exciting and there’s a great connection between you and the audience. Why do you think people here get you? People from Manchester just seem to have an amazing connection with music in general. It's like bands mean so much more to people there and when we play shows there, you can see how much music - particularly live - means to them. I guess maybe it comes from the huge musical heritage of the city, but from where we are from in Taunton, people just don't seem to have that same hunger for new and live music. As to why people connect with us, it's something I don't try to over analyse. Something we do just seems to work here and i hope that continues! In the past you’ve played shows with The Slow Readers Club who, like you, have spent time playing the circuit building a fan base rather than being an immediate success. Does that make you feel like the industry is opening up more to bands like you? I think as long as there's a market for something then the industry will move with that. Slow Readers Club have proved that there's a market for what they do and as a result doors are and will open for them. There are so many bands who are/were amazing, but just didn't get the right breaks, so never got a chance to reach the heights that they perhaps could have. It's nice to see a band work so hard for so many years and finally get a reward for that. I don't think Slow Readers are there yet in terms of their potential though. In a way I feel like this is the beginning for them and over the next few years will eclipse what they've already achieved. If more guitar bands hit the same level as Slow Readers, then things will start changing and you'll notice more bands like that getting played on national radio etc. I guess a certain genre has to become the latest 'cool thing' before it gets properly picked up. You’ve just released your new single All Broken Down. Could you tell us what it’s about please and how it was written? None of our songs are really about one thing inparticular, they are more about getting a certain feeling or emotion into something. I guess as like a release. Our singer Kiran wrote the lyrics whilst stranded at bristol templemeads station at 4 in morning - not a bad way to pass the time. The concept behind the video is an interesting one. Who came up with the idea to it? We met a guy called Steve Glashier who's essentially a mad genius. I think he has an addiction to making music videos. He flew in from Germany and took a 4 hour coach to get to the shoot, which was at a country house just outside of Taunton. We basically just filled our van with the weirdest stuff we could find and got a bunch of people to come down and be filmed doing stuff. There wasn't really a concept - we just kinda said 'lets see what happens'. It all seemed to work out in the end though! One of the things that’s noticeable at your gigs is the merch desk and the singles being available in physical formats. Is that something you consider particularly important? Yeah we're really into the artwork and image behind bands and we wanted to make ours as stand out and recognisable as possible. I think when you go to a show it's nice to have something physical to take home. I guess as more of a souvenir than anything. I think when you're talking about for the masses then physical music (especially cd's) seems to be pretty much over though. I know that there has been a resurgence in vinyl sales over the past few years, but I see it being more of a fad than a sustainable way for the masses to consume music. One last question, if someone’s reading this who hasn’t heard October Drift, how would you describe yourselves? Four guys playing rock together, trying terribly hard to not get a real job. Their headline tour takes in London Birthdays (10), Leicester Dryden Street Social (11) and Manchester Night And Day (12) before they head to Europe to support Editors. October Drift's official website can be found here. They are also on Facebook and Twitter. We are Even The Stars, an independent music blog based in Manchester. We're not music journalists, we're not clickbait cowboys, we write about the music we love for that reason in the hope other people might love it too. Creativity is nothing without substance.